There is power in education, which is why, as part of the five-year educational partnership announced in fall 2018, employees of the Boston Bruins, TD Garden, and Delaware North will have the opportunity to receive a tuition scholarship to Johnson & Wales University. This fact alone makes pursuing or completing a college degree a more realistic endeavor for the organizations’ more than 50,000 employees. Dreams will be followed. Lives will change. But the partnership doesn’t stop there. Directed Experiential Experiences (or DEEs), or term-long projects that expose JWU students to the business of running a top-tier sports/entertainment/event facility. Seasonal menu items, developed by JWU students, offered at Legends, a members-only restaurant at TD Garden. An upcoming seminar planned for fall 2019, pivoting around innovative approaches to game-day preparation. In addition to the above, members of the Providence Bruins team visited a culinary lab at the Providence Campus earlier this spring and learned how to prepare food that will fuel their performance. And most recently, JWU Providence senior Amy Peralta ’19 had the opportunity to cook for players of the NHL team at TD Garden, putting her coursework in clinical dietetics in action. Amy’s experience was showcased on the April 10 episode of NESN’s “Behind the B”. 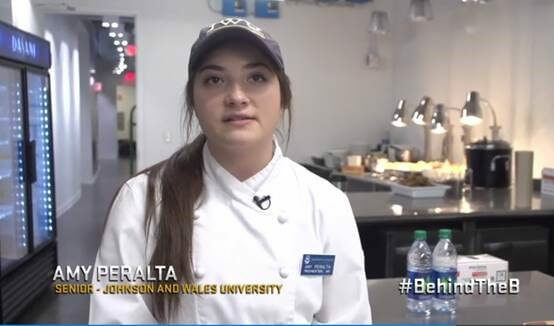 She spent the day alongside team chef Keith Garman ’09, a JWU alum, learning how to nourish professional athletes and how her passion for healthful cooking could one day soon turn into a career. Together, Johnson & Wales, the Boston Bruins, and TD Garden are redefining what it means to form an educational partnership — and, only six months in, it’s clear that the innovation has just begun. To learn more about corporate partnerships, click here.